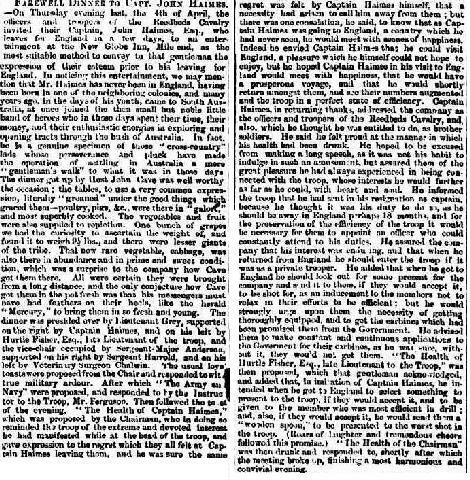 The South Australian Advertiser, Friday, 5 April 1861, p. 3. FAREWELL DINNER TO CAPT. JOHN HAIMES. On Thursday evening last, the 11th of April, the officers and troopers of the Reedbeds Cavalry invited their Captain, John Haimes, Esq., who leaves for England in a few days, to an entertainment at the New Globe Inn, Mile end, as the most suitable method to convey to that gentleman the expression of their esteem prior to his leaving for England. In noticing this entertainment, we may mention that Mr Haimes has never been in England, having been born in one of the neighbouring colonies, and many years ago in the days of his youth came to South Australia, at once joined the then small but noble little band of heroes who in those days spent their time, their money, and the enthusiastic energies exploring and opening tracts through the bush of Australia. In fact he is a genuine specimen of those ''cross country" lads whose perseverance and pluck have made the operation of settling in Australia, a mere "gentleman's walk" to what it was in those days. The dinner got up by Host John Cave was well worthy the occasion; the tables to use a very common expression, literally "groaned" under the good things which graced them - poultry, pigs, &.c were there in "galore" and most superbly cooked. The vegetables and fruit were also supplied to repletion. One bunch of grapes we had the curiosity to ascertain the weight of, and found it to weigh 9½ lbs., and there were other lesser giants of the tribe. That now rare vegetable, cabbage, was also there in abundance and in prime and sweet condition, which was a surprise to the company how Cave got them there All were certain they were brought from a long distance, and the only conjecture how Cave got them in the pot fresh was that his messengers must have had feathers on their heels, like the herald "Mercury", to bring them in so fresh and young. The dinner was presided over by Lieutenant Grey, supported on the right by Captain Haimes, and on his left by Hurtle Fisher, Esq., late Lieutenant of the troop, and the vice chair occupied by Sergeant Major Anderson, supported on his right by Sergeant Harrold, and on his left by Veterinary Surgeon Chalwin. The usual loyal toasts were proposed from the Chair and responded to with true military ardour. After which "The Army and Navy" were proposed and responded to by the Instructor to the troop, Mr Ferguson. Then followed the toast of the evening, "The Health of Captain Haimes," which was proposed by the Chairman, who in doing so reminded the troop of the extreme and devoted interest he had manifested while at the head of the troop, and gave expression to the regret which they all felt at Captain Haimes leaving them, and he was sure the same regret was felt by Captain Haimes himself, that a necessity had arisen to call him away, from them; but there was one consolation, he said, to know that as Captain Haimes was going to England, a country which he had never seen, he would met with scenes of happiness. Indeed he envied Captain Haimes that he could visit England a pleasure which he himself could not hope to enjoy, but he hoped Captain Haimes in his visit to England would meet with happiness that he would have a prosperous voyage, and that he would shortly return amongst them, and see there numbers augmented and the troop in a perfect state of efficiency. 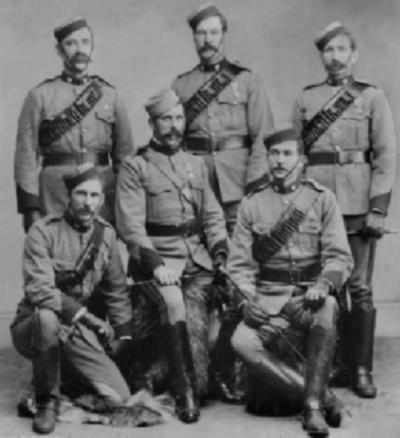 Captain Haimes, in returning thanks, addressed the company as the officers and troopers of the Reedbeds Cavalry, and also, which he thought he was entitled to do as brother soldiers. He said he felt proud at the manner in which his health had been drunk He hoped to be excused from making a long speech, as it was not his habit to indulge in such amusement, but assured them of the great pleasure he had always experienced in being connected with the troop whose interests he would further as far as he could, with heart and soul. He informed the troop that he had sent in his resignation as captain because he thought it was his duty to do so, as he should be away in England perhaps l8 months, and for the preservation of the efficiency of the troop it would necessary for them to appoint an officer who could constantly attend to his duties. He assured the company that his interest was enduring, and that when he returned from England he should enter the troop if it was as a private trooper. He added that when he got to England he should look out for some present for the company and send it to them, if they would accept it, to be shot for, as an inducement to the members not to relax in their efforts to be efficient; but he would strongly urge upon them the necessity of getting thoroughly equipped and to get tho carbines which had been promised them from the Government. He advised the, to make constant and continuous applications to the government for their carbines, as he was sure, without it, they would not get them. "The Health of the Chairman" was then drunk and responded to, shortly after which the meeting broke up, finishing a most harmonious and convivial evening. The importance of this story lies in the fact that it goes into great detail about the structure of the Reedbeds Volunteer Cavalry, the first mounted formation in South Australia which at the time of this article, maintained a Nominal Roll of 33 men all ranks. An issue flagged by Captain Haimes in his speech related to the promise by the Government to provide carbines for the unit. While the men provided their own horse and saddle while paying for their uniform as Volunteers, the South Australian Government had promised to arm the men. Years of attempting to get arms from the Government had met with deaf ears. Indeed, it became quite a scandal in South Australia that the Cavalry had no arms. In the end, the press advocated this cause in the community and eventually the men were provided with carbines. Reedbeds Volunteer Cavalry - 33 men. South Australian Free Rifle Corps - 31 men. Cadet Company - 41 Cadets. The following is a transcription from a brief outline of the South Australian Mounted Rifles history produced in 1959. Originally raised by Governor GAWLER in February of 1840 as 2 troops of cavalry to provide the mounted troops of the Royal South Australian Volunteer Militia Brigade, this Regiment is believed to be the first volunteer unit raised in Australia. Even though not financed by the Government from 9 February 1856 until June 1877, the Regiment continued to exist, on a completely voluntary basis - horses, uniforms arms and equipment being provided by each member at his own expense. In recognition of its having provided guards and escorts for H.H. the Duke of Edinburgh in 1867 the Regiment was dubbed the Duke's Own Cavalry. In June 1877, at the instigation of the Mayor of ADELAIDE the Regiment was reformed and financed by the South Australian Government. colonel, this same Cpl De Passy again commanded the Regiment in South Africa. Twenty-five all ranks were selected in 1897 to represent South Australia at Queen Victoria's Diamond Jubilee. The Regiment sailed for South Africa in 1899 and saw action for the first time at Britstown on 6 Feb 1900 on which day, the first decorations for bravery were won, three troopers each being awarded the DCM. The unit served under Lord Methuen who wrote of them, "they did splendid work and were cheerful in hardships. I cannot conceive any body of men of whom a commander has better reason to be proud." On its return to Australia in 1902 after Federation, the Commonwealth Government re-organised the South Australian Mounted Rifles as three Regiments of Light Horse the 22nd, 23rd, 24th. Upon the outbreak of war in 1914, these Regiments were again re-organised as the 3rd and 9th Australian Light Horse Regiments AIF and served on Gallipoli, and through Egypt, Palestine and Syria. It was during thus operations that the 9th Regiment captured the battle standard of a Turkish Regiment which now hangs in the War Museum, CANBERRA. Thus the Regiment has the honour of being the only unit to capture such a Standard during the Great War. Both Regiments of the South Australian Mounted Rifles returned to Australia in 1919 and continued as Militia units until 1940, when they were formed into an Armoured Car Regiment, and reformed in 1948 into one regiment the 3/9 SAMR, which is now a unit of the Royal Australian Armoured Corps. For service in the Boer and Great War the regiment was awarded two sets of Guidons one each to the 3rd and 9th Regiment of Light Horse. 4TH MILITARY DISTRICT - SOUTH AUSTRALIA. 22nd Light Horse (South Australian Mounted Rifles).